Here again I sit wondering who said salads were boring? Almost every time I sit here with a salad I wonder this and think my salads aren’t boring. The next time I hear someone say salads are boring I am going to prove them wrong! First by telling them to search salads on my blog and second by making them a salad! 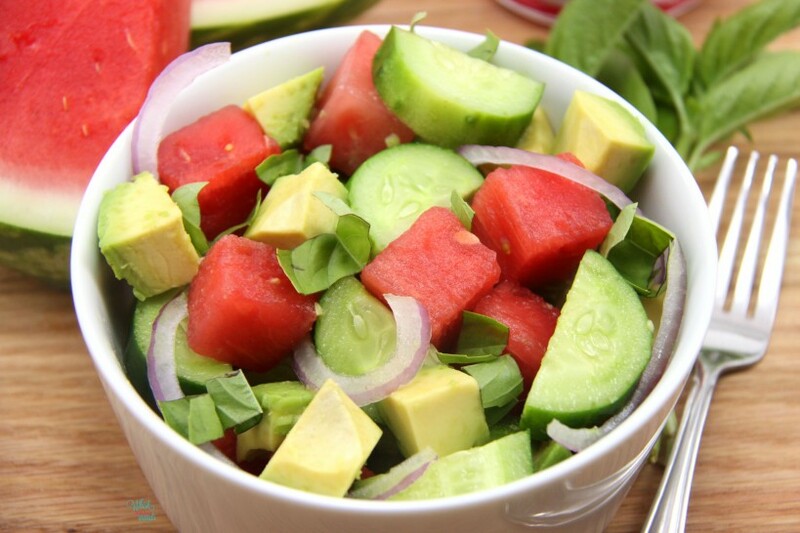 Berries have been replaced in my salads lately with other in season fruits like watermelon. 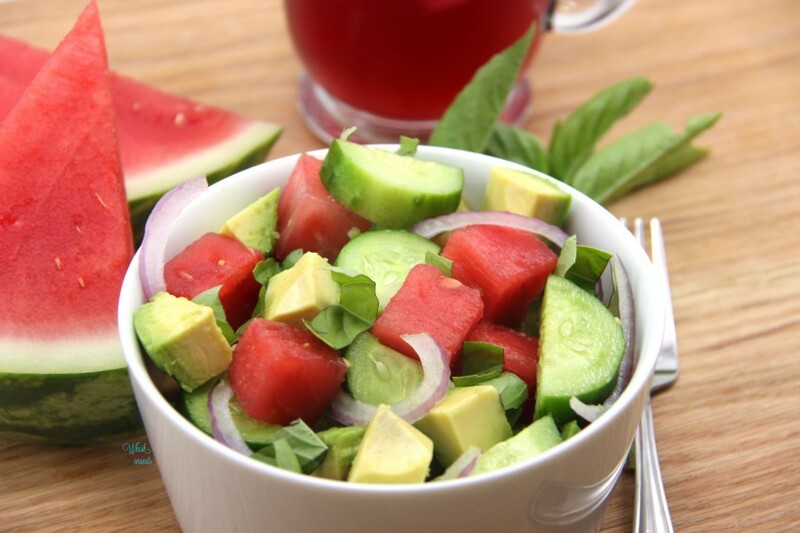 Yes watermelon in a salad, if you haven’t tried it you must it is so refreshing! This time I paired them with cucumbers and basil from our garden, avocado and red onion. Our onions aren’t ready yet so I’m still buying those and no avocado tree here unfortunately but wouldn’t that be the life if I did. If only more things grew here I would have avocado trees, citrus trees, fig trees, and a much bigger garden. Someday maybe as getting more land and having apples trees is on our list. Back to the salad, one bite, just one bite and I think you will love this fresh flavorful combo too. 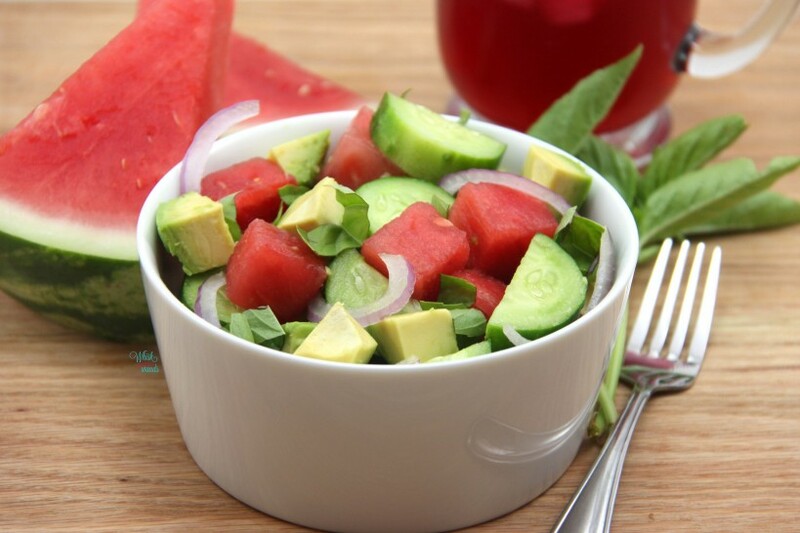 I wrote the recipe out for one as this is one I often throw together for lunch but it is easily multiplied to make for the family for dinner or for a large group for a picnic, just remembering to add the avocado just before serving if making ahead of time. 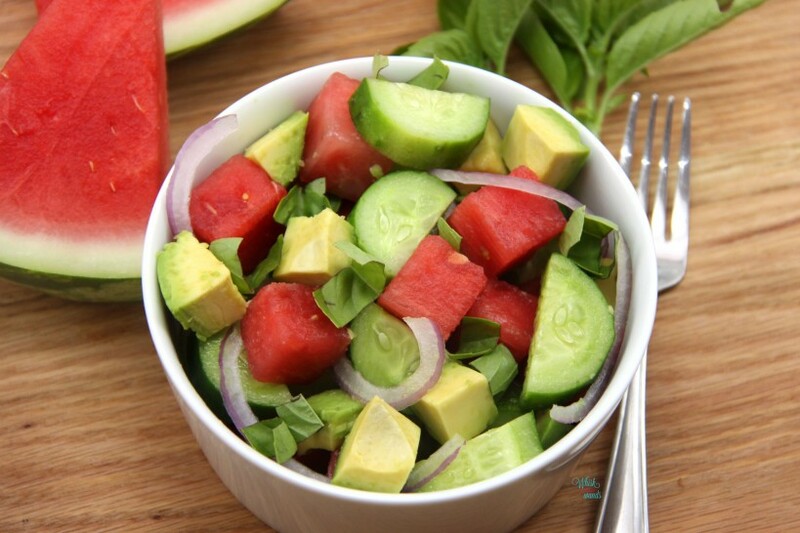 In a bowl or on a plate combine watermelon cubes, avocado cubes, red onion slices, cucumber, and basil. Season with sea salt and pepper to taste. Simple as that, enjoy! 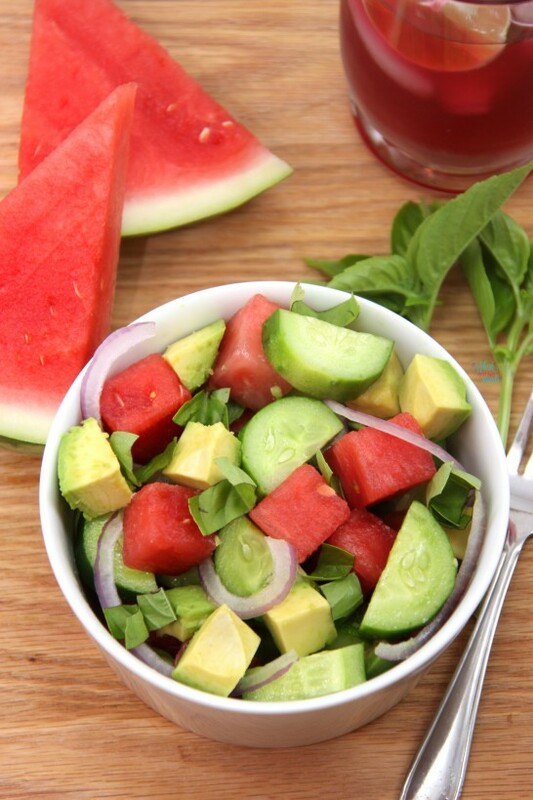 Interesting combo there with the watermelon and the onion. I will have to try that! Thank you! Just remember to set aside some watermelon when cutting it or it may disappear before you can make it! 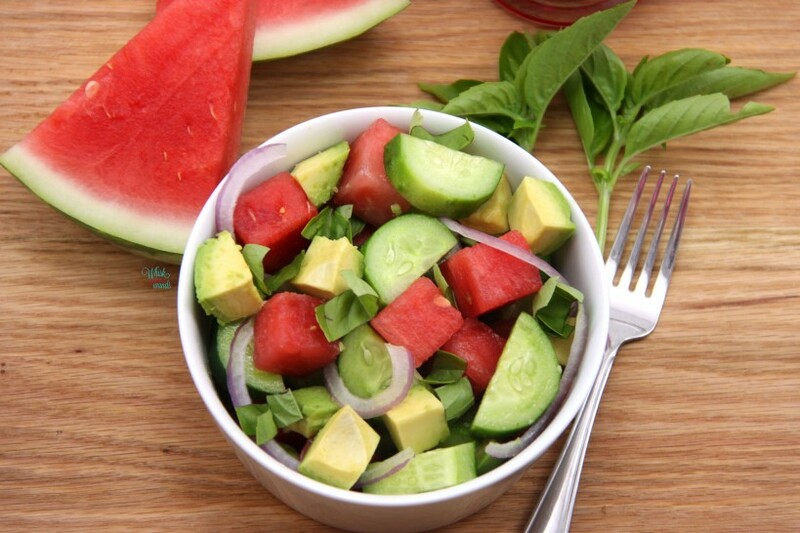 I love a watermelon salad! The avocado is such a good idea. I like to add some salty cheese like a feta too. I just love watermelon! 😉 Yes it is great with a soft goat cheese too but my tummy can’t handle it right now so I did avocado, which is always a good idea! watery and sweet and savory and smooth and all around refreshing. Yum! your salads are far from boring.agreed! and i am currently i need of this with 104F on the radar today! ACK! I’m glad you think so Lindsay because I wrote up 3 more tonight, haha! Oh this would be so refreshing on a hot day. I have one that would be so perfect that I will have to get posted soon! So many good ones I think I’m going to have to post them more often to get them all posted before fall!